Click for the Season Two review in the SF Examiner. SFDanceworks Season Two featured in the June 2017 issue of Dance Magazine. Feature in the San Francisco Chronicle by Mary Ellen Hunt. Click for full article. 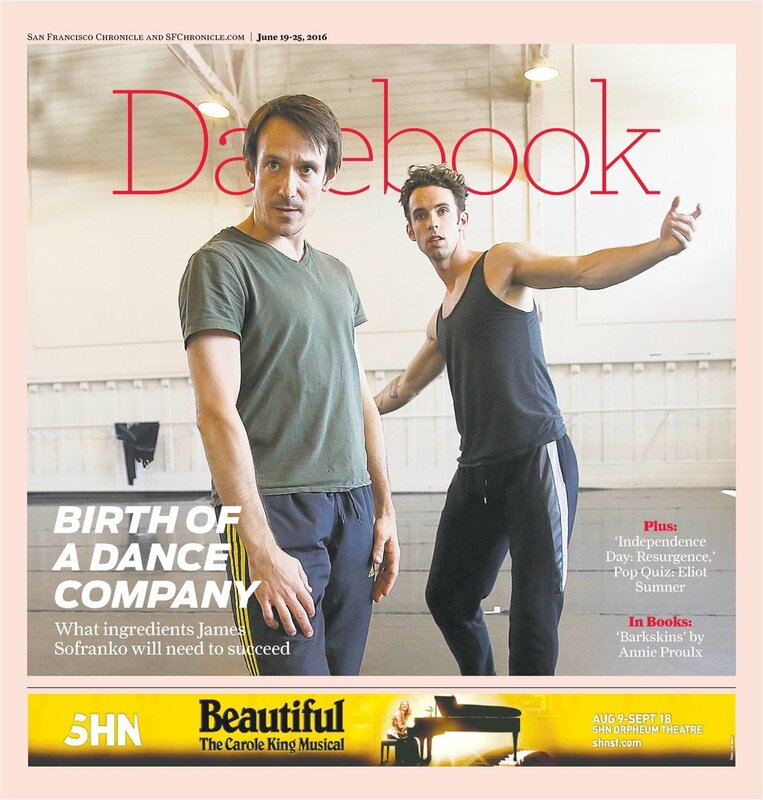 SFDanceworks review in the San Francisco Chronicle. June 25th, 2016. Click for full article. "All the dancers are technically gifted and, more importantly, wonderfully musical, qualities called upon by the five works on the bill...Sofranko has proved himself a good curator of choreographic and dance talent, with a preference for loveliness in movement and movers." "Sofranko has assembled a crackerjack troupe of seven dancers...Together they are on a bold mission to showcase the 'past, present, and future of dance.'" "Sofranko shared the vision driving SFDanceworks – to showcase breadth in dance performance, across both time and style. And with this first program, he has more than delivered on that goal and vision." "The versatile, much-in-demand San Francisco Ballet soloist James Sofranko has worked with many of the great choreographers of our time. A piece of his own devising, the elegant and poignant Means to an End, was most recently polished and dispatched by San Francisco Ballet School trainees at their annual showcase. Somehow Sofranko has found time amid all this to launch a new chamber ballet company. In its first outing, SFDanceworks will feature three world premières by Sofranko, Penny Saunders of Hubbard Street Dance and Dana Genshaft, former SFB soloist. The Adagio from Lar Lubovitch’s Concerto Six Twenty-Two (one of the all-time great male duets) and Alejandro Cerrudo’s Lickety Split complete the program." "The SFDanceworks' debut, co-presented with ODC Theater, promises to be an auspicious beginning. With both top-drawer dancers and choreographers, some of whom are already familiar to Bay Area dance audiences, all bets are on for a winning premiere season."